Appearing under birch trees, this summer and autumn bolete is one that even inexperienced fungi foragers are unlikely to confuse with any of the dangerously poisonous gilled mushrooms. Leccinum scabrum is a very common mushroom, but that doesn't mean that its identification is easy. As with all members of this deceptively difficult group, confident differentiation of the various Leccinum species requires study of both macroscopic and microscopic features. Various forms of this bolete were formerly treated as separate species - for example Leccinum rigidipes, Leccinum avellaneum and Leccinum roseofractum - but molecular studies have not supported these differentiations at species level. A pale-capped form was - Classified as Leccinum avellaneum (J. Blum) Bon. This is a very variable mushroom, and just occasionally you may come across a 'Brown' Birch Bolete whose cap is almost pure white! Frequent in Britain and Ireland, the Brown Birch Bolete is also common throughout most of mainland Europe, from Scandinavia right down to the Mediterranean and westwards across the Iberian peninsula. Leccinum scabrum is also very common in North America. The Brown Birch Bolete was described in 1783 by French naturalist Jean Baptiste Francois (Pierre) Bulliard, who gave it the binomial scientific name Boletus scaber. 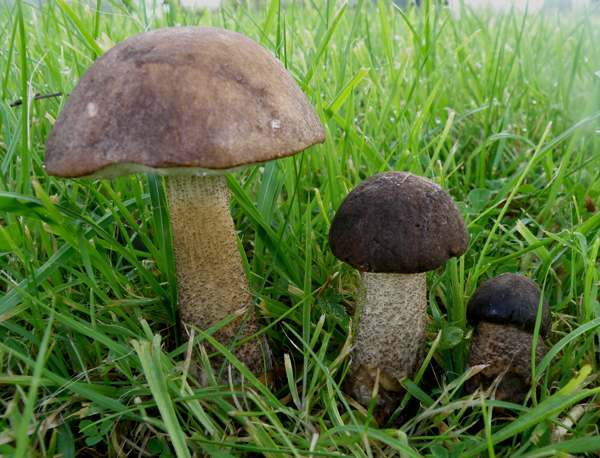 the currently-accepted scientific name Leccinum scabrum dates from an 1821 publication by British mycologist Samuel Frederick Gray (1766 - 1828). Leccinum, the generic name, comes from an old Italian word meaning fungus. The specific epithet scabrum means with scabers - a reference to the rough or scurfy surface of stems of this species. Caps range from 5 to 15cm in diameter when fully expanded. 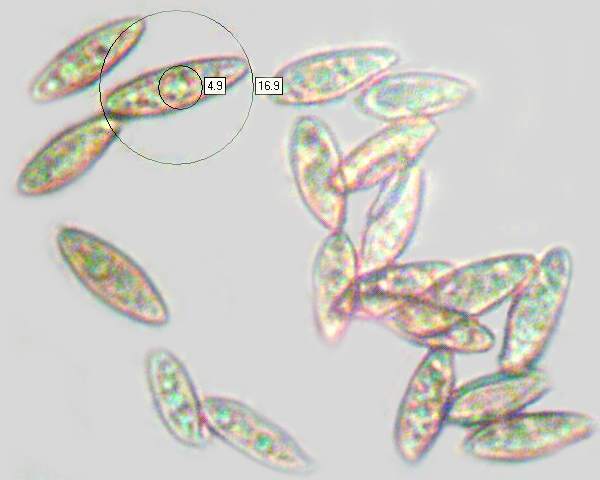 The small, circular tubes are broadly adnexed (but not adnate) to the stem; they are 1 to 2cm long, off-white, and terminate in pores that are similarly coloured, sometimes with brownish spots. When bruised, the pores do not undergo a rapid colour change but gradually turn slightly browner. 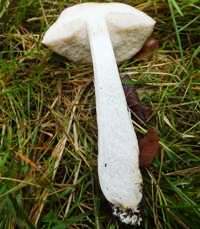 White or buff and 7 to 20cm tall, the stems of Leccinum scabrum are 2 to 3cm in diameter. Immature specimens have barrel-shaped stems; at maturity most stems are more regular in diameter, tapering slightly towards the cap. 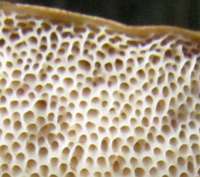 Dark brown woolly scales cover the whole of the stem surface but are noticeably coarser on the lower part of the stem. The stem flesh is white and sometimes turns slightly pink when it is cut or broken - but never blue... a helpful identifying feature. 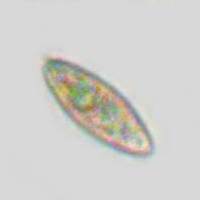 Narrowly ellipsoid to subfusiform, 14-20 x 4.5-5-5 µm, thin-walled, with vacuole inclusions. The faint smell and taste are pleasant but not particularly distinctive. 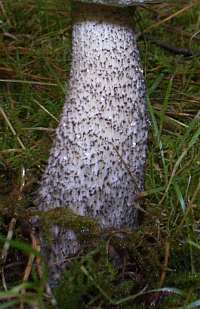 All Leccinum species are ectomycorrhizal, and most are found only with one tree genus. Laccinum scabrum is mycorrhizal only with birch trees (Betula spp.) and in Britain and Ireland this mushroom is found nearly always beneath Silver Birch Betula pendula and Downy Birch Betula pubescens. Leccinum cyaneobasileucum, also found under birches, has flesh which turns blue near the stem base. Leccinum versipelle has a more orange cap and bruises blue-green in the stem base. Leccinum scabrum is generally considered to be a good edible mushroom and can be used in recipes that call for Ceps Boletus edulis (although in both flavour and texture a Cep is superior). 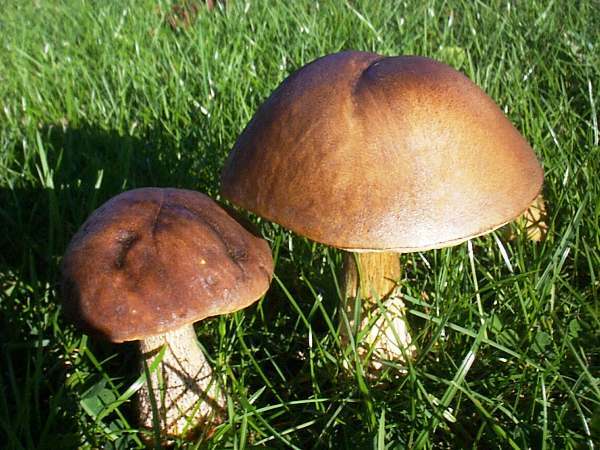 Alternatively, use Brown Birch Boletes to make up the required quantity if you do not have sufficient Ceps. Henk C. den Bakker, Barbara Gravendeel & Thomas W. Kuyper (2004). An ITS phylogeny of Leccinum and an analysis of the evolution of minisatellite-like sequences within ITS1; Mycologia, 96(1), 2004, pp. 102-118. British Boletes, with keys to species, Geoffrey Kibby (self published) 3rd Edition 2012.